Background There is a lack of expertise in rheumatoid arthritis (RA) diagnosis in primary level of Colombian medical centers, leading to misdiagnosis; many times osteoarthritis (OA) and another rheumatic diseases are misdiagnosed as RA which derives in wrong treatment for patients with clinical and health economics implications. Objectives The objective of this study was to describe demographic and clinical characteristics of a cohort of patients derived to a specialized RA center with presumptive RA diagnosis and finally diagnosed as osteoarthritis. Methods A descriptive, cross sectional study. Were included patients who were referred from primary care centers to a RA specialized center in a 36 month period with presumptive diagnosis of this disease. Each patient was evaluated to confirm or rule-out diagnosis of RA as follows: a rheumatologist fulfilled a complete medical record, including joint counts; it was assessed rheumatoid factor and anti-citrullinated antibodies, and other laboratories depending on each case. Also were made x-rays of hands and feet, and in some cases of persistent doubt about the diagnosis was requested comparative MRI of hands or/and feet. Frequencies and percentages were calculated for the demographic and clinical characteristics of the cohort of patients in which the diagnosis of RA was ruled-out. 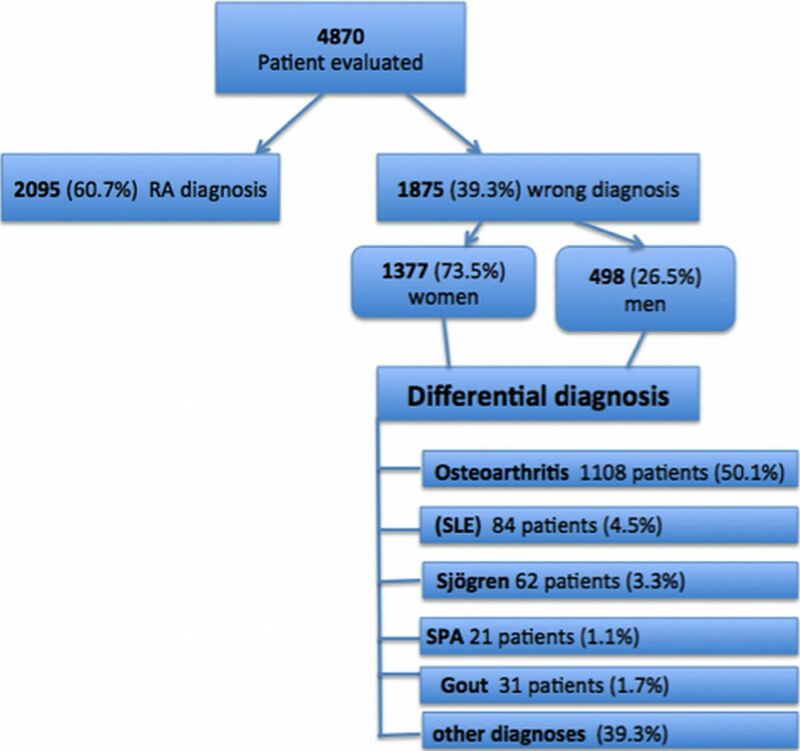 Results Of the 4780 patients evaluated, in 2905 patients (60.7%) diagnosis of RA was confirmed, the remaining 1875 patients (39.3%) had a wrong diagnosis of RA. Of these misdiagnosed patients, 1377 (73.5%) were women, and 498 (26.5%) men, with an average age of 57.6 (±12 years). Between differential diagnosis which were found in this cohort of misdiagnosed patients: osteoarthritis in 1108 patients (50.1%), systemic lupus erythematosus (SLE) in 84 patients (4.5%), Sjögren syndrome in 62 patients (3.3%), spondyloarthropathies in 21 patients (1.1%), gout in 31 patients (1.7%), and (39,3%) other diagnoses in of the remaining population. Conclusions Almost half patients with presumptive RA diagnosis in primary care centers in Colombia are misdiagnosed as shown in this large cohort. The most important cofounding diagnosis was osteoarthritis and many patients were receiving DMARDs for treatment. For this reason there is an urgent need of education strategies for primary care physicians and the implementation of centers of excellence in RA, in order to conduct a proper diagnose and avoid clinical and health economics consequences of misdiagnosis.